If you are reading this, you are very likely trying to get back data lost when your Acer Aspire S5 or S7 laptop failed on you. The SSD might be perfectly fine, but getting the data back will be quite the challenge as we’ll outline in this article. Like many other laptops, Acer Aspire S5 and S7 laptops use an mSATA SSD which fits into a slot on the computer’s motherboard. However, Acer doesn’t use the mSATA slot in the standard fashion it was intended for. To provide more speed and larger SSD capacity (while saving cost), Acer opted to create a RAID 0 SSD unit and build it into a single mSATA package. RAID 0 is what is known as a stripe array. Basically, two or more drives are used in tandem with blocks of data being stored on alternating drives. So the data is split between drives in a striped pattern. mSATA, however, was not designed with RAID in mind. The specification only calls for a single set of SATA data lanes. What Acer did was to build two entirely separate SSDs onto a single PCB board. Sometimes they are side by side, other times they are on opposite sides of the PCB. But, they operate totally independently of each other. Since two separate drives can’t share the same SATA connection, Acer had to improvise and add in SATA lanes using pins normally reserved for system reserved purposes. 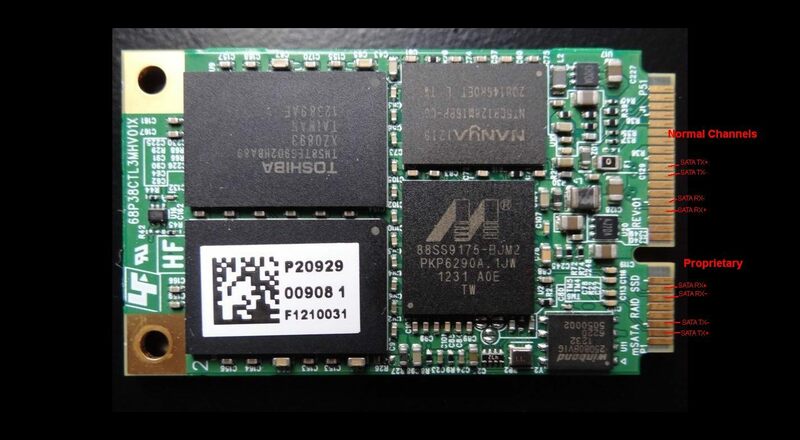 As you can see in the image here, Acer SSDs look like a standard mSATA and even fit into a standard mSATA port. However, there are certain pins (marked in red at the bottom) which are proprietary only to these laptop SSDs. Normally when trying to extract data from an mSATA SSD you can simply plug it into an adapter which converts to a standard computer SATA cable. With these SSDs, though, that’ll only permit access to one-half of the array. Given the stripe arrangement of RAID 0, this doesn’t result in any usable data. RAID recovery will require some professional data recovery software and a steep learning curve. If you’re very technically savvy you might be able to pull it off on your own though. However, you’ll first need to come up with a way to read both SSDs and that’s the biggest challenge with these. If you’re not up to such a challenge, don’t worry. If there is nothing wrong with your SSD itself, our rate to recover the data out and reconstruct it from the RAID is only a flat $600. Usually, our rates for RAID recovery start at $750, but since the parameters on these don’t vary much, we can quickly figure out each one and provide it for a special discount rate. Of course, if the SSD has itself failed and will require firmware repairs or a chip-off solution, the cost will be higher. Please contact us if you suspect your SSD has failed and you’d like more details.